Available for for grades K-3, 4-8 and 9-12. In this 10-day arts integration program, students and teachers explore a children’s literature book and adapt it into a classroom play to perform for family and friends. Using the book as a jumping off point for both academic and social learning, children embody the story physically, explore vocabulary, build comprehension, enhance self-presentation skills, and investigate English Language Arts (ELA) concepts such as character, setting, and plot. Through their physical engagement, children are led through a process of self-discovery that develops physical awareness, cooperative learning skills, self-confidence, patience, and self-control. Each workshop session includes theater arts warm-ups and performance exercises that help students develop public speaking and dramatic arts skills. From Page to Stage classroom residencies provide embedded professional development for teachers, as we model strategies to capture student’s imagination and nurture language development through the creative arts. Using the 7 Habits of Effective Readers and anchor ELA standards in the National Common Core, teachers will gain transferable skills to provide students and their families multiple opportunities to find a personal connection to literacy, making the early childhood curriculum compelling and relevant. .
“The Enchanted Circle project with our Kindergarten and 1st grade students was a valuable experience for all involved…the teachers found the entire experience rewarding for relating literature to language expression and student empowerment…The impact on the students’ literacy skills is tremendous.” ~Hilary Russell, Principal, McMahon School. 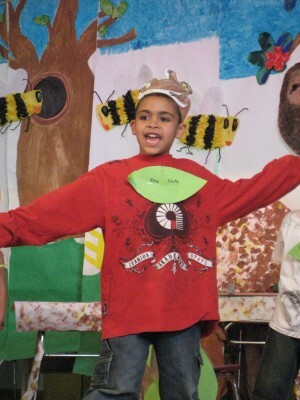 In this 8-day arts integration program, students and teachers explore a children’s literature book and adapt it into a classroom play to perform for family and friends. Using the book as a jumping off point for both academic and social learning, participants embody the story physically, explore vocabulary and reading aloud skills and investigate concepts such as character, setting, and plot. Through their physical engagement, children are led through a process of self-discovery that develops physical awareness, cooperative learning skills, self-confidence, patience, and self-control. Each workshop session includes theater arts warm-ups and performance exercises that help students develop public speaking and dramatic arts skills. FROM PAGE TO STAGE is an exceptional technique for engaging second language learners in the process of reading. Teachers are actively involved in the creative process of FROM PAGE TO STAGE and learn easily replicable classroom teaching strategies.